This has not been my day to do anything with photos, computers, or cameras, so I'm very late posting. I found something absolutely scrumptious on Flickr. If you want to see an iconic group of Barbies, including the delectable Audrey Hepburn, check out madalosso.laura's Icons set. People's ability to create something fabulous for Barbie always awes me. I felt it on Sunday night when I saw Mark's Oscar dress for Figaro, and again when I saw Timothy's latest creation for Nikki. In person, Tim's classic design gives the illusion of constant movement. 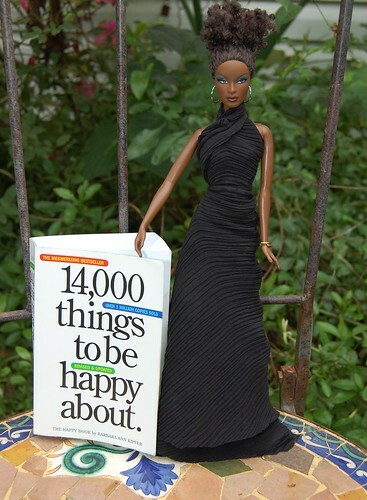 Nikki has agreed to be a doll and find you something from this book to be happy about if you comment with a page number between 1 and 611, and another number between 1 and 25.